SV Vega is an 11.5 metre ketch launched in 1949 near Whangarei. Built on a Northland beach without the aid of power tools, she was planked from a single kauri log. 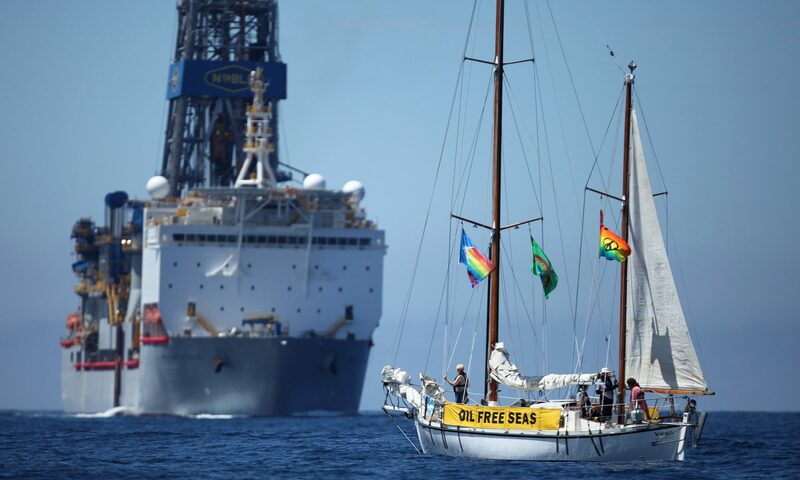 In the early 1970’s she was bought by David McTaggart, a Canadian living in New Zealand, who went on to become the Chair of Greenpeace International. 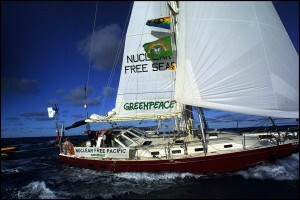 Vega has participated in campaigns around the globe promoting Nuclear Free seas, highlighting toxic issues, opposing driftnets and working to protect the environment. 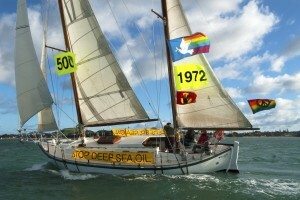 She was also part of the Stop Deep Sea Oil flotilla in 2011. SV Baltazar is a Meta 52 designed, ‘Damien II’ Built in 1983, Construction Steel, Rig, Cutter Sloop. Purpose built for High latitude expeditions with a large carrying capacity and a very seaworthy set up. She has been sailing as far as Greenland, Svalbard, Patagonia and countless years in Antarctic waters. She arrived to New Zealand shores in 2011 and is now based out of Wellington. SV Tiama is a 15.15 metre steel cutter, designed by Alan Mummery, built by Henk Haazen.As a high latitude expedition sailing vessel she has logged over 100,000nm since her launch in December 1997. For the last 11 years Henk has been skippering Tiama on expeditions to some of the most remote parts of the region mainly in the polar and sub-Polar regions, but also on a 3 month expedition on the Fly River penetrating deep into the jungle of Papua New Guinea. 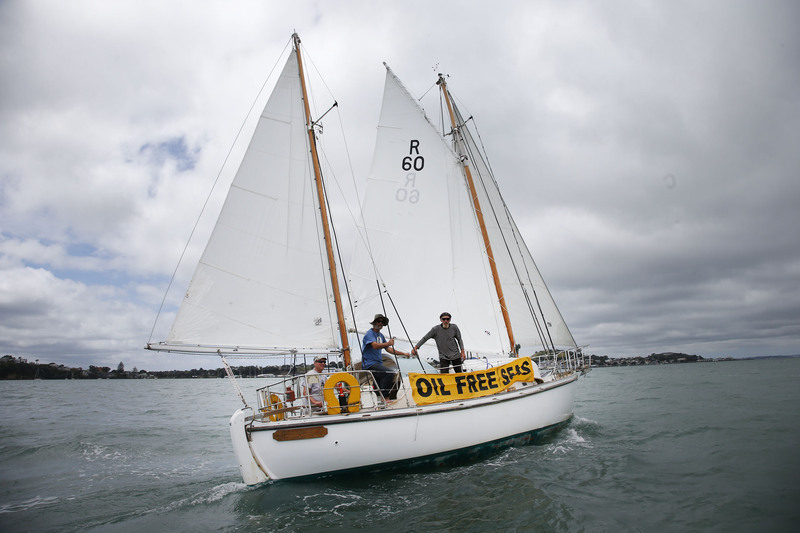 Tiama and Henk have also been part of the Nuclear Free Seas Flotilla and.the Stop Deep Sea Oil Flotilla – true.campaigners for the environment. 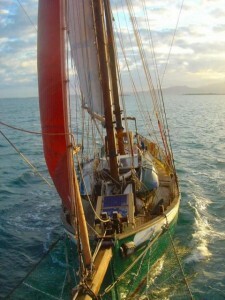 SV Ratbag is 43-foot gaff-rigged topsail schooner, a traditional wooden classic. Built in the traditional manner by the late Curtis Ashford. She was first launched in 1985, and is a replica of the American Gloucester fishing schooners of the 1860’s. These sail-driven commercial craft were much admired for there fine sailing qualities, seaworthiness, and beauty. She has been with her current skipper for eleven years regularly plying the South Pacific ocean, involved in humanitarian projects and environmental coral reef protection work. 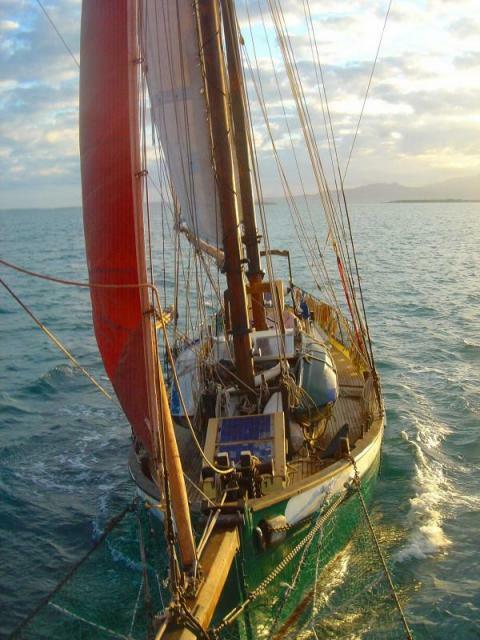 She prides herself as being a carbon neutral sailing ship. SV Friendship is a 45 foot Herreshoff Mobjack Ketch and was launched in 1988. Friendship’s story began in 1976 when three New Zealanders, the late John Simpson, Anna Horne, and Rex Le Grice began a quest to build their vision of a perfect sailing yacht. She consists of 17 different woods, among them Tasmanian Blackwood, New Guinea Kwila, Macrocarpa, Rewa, Totara, heart Kauri, and Oregon Pine. Friendship‘s Skipper, Tim Foreman, has been her guardian since late 2005 and together they have visited in excess of 30 countries around the globe. 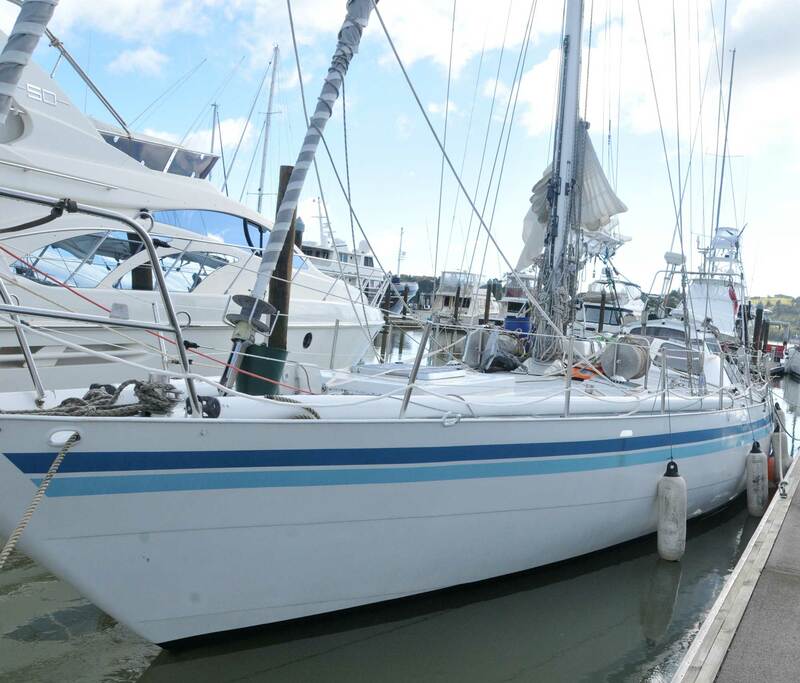 Shearwater II was designed by Len Randall from Western Australia and built in Williamstown. She was launced in 1962. 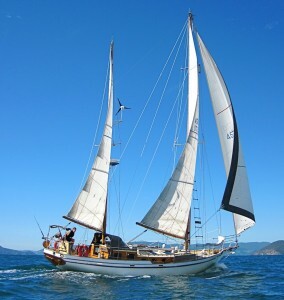 Shearwater is an 11 metre, double ended, ketch made from planked Huon Pine with spotted gum frames. Current owner, Aliastair Robinson bough her in 2009.